Storytelling, communication and improvisation are all important elements of theatre. Award-winning director Kari Margolis has been integrating those elements into her actor training system over the past 30 years called the Margolis Method. No stranger to Millikin University, Margolis has been teaching her method to Millikin students the last few years as part of Millikin's winter immersion curriculum. So what is the Margolis Method? The method is a three-dimensional approach to theatre training that merges the skill sets of acting, directing and playwriting. The method offers a comprehensive series of theatrical exercises based on the principles of physics and communication, allowing actors to build and hone their skills as true artists. 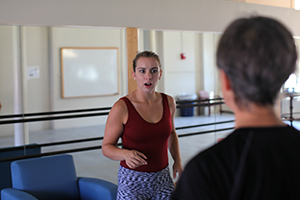 Denise Myers, Millikin professor of theatre and dance, has been integrating the Margolis Method into her courses, as well as main stage and children's theatre productions. Myers is now researching more ways to incorporate the method in Millikin's theatre curriculum with help from Lexi DeSollar, a senior theatre major and James Millikin Scholar (JMS) from Beardstown, Ill.
"I have found these methods to be continually successful with student learning," said Myers. "Over the past five years, Kari Margolis has opened up the opportunity for college professors to come and train in teaching her methods, and I have been one of the original certifying professors since the initiation of this training." Myers added, "Margolis bases her methods on physics and natural momentum. What's unique about her point of view is that she's not teaching a system of acting, but she's teaching how to train actors." Myers is also focusing on finding how the Margolis Method is a foundation for actors who can then interact with any system of acting such as the Stanislavski system – one of the most prevalent acting methods taught in the United States. A particular focus of the summer has been to research the Margolis Method as a springboard for scene work. Myers noted, "Ultimately, the goal would be to write and to publish our findings and bring awareness of the method to actors, and to other teachers of acting and movement." In addition, Myers and DeSollar are working on creating an original children's theatre production inspired by the Margolis Method's improvisational structures. "The process of working and training together is a perfect example of Performance Learning," says Myers. "We are honing our own acting skills as we provide information to third party stakeholders – to the artist (Margolis), to future theatre and dance students, and to other acting teachers." 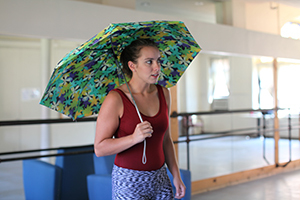 Selected for the fellowship because of her acting curriculum experience, Lexi DeSollar studied under Kari Margolis during two immersion courses and was directed by Margolis in a devised physical theatre piece presented at Millikin. "The method changed my entire perception of how I thought about myself as an actor," said DeSollar. "I've learned so much from this experience and because of that, I can teach other students this method." DeSollar added, "I'm astounded by the fact that what we do is really important. It's beneficial to actors and students to get the word out about this method and show how it can be utilized." Millikin's SURF Program pairs a student with a faculty member to perform in-depth research throughout the summer months. An example of Performance Learning, the research is one of the "graduate level" opportunities undergraduates experience at Millikin. 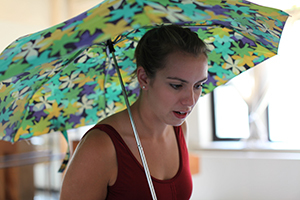 The 2015 SURF Program features Millikin students and faculty across multiple disciplines conducting research and collaboratively building new academic ground. This summer, three SURF fellowships were granted.